Scrappy is a scruffy grey and beige cat with white paws. 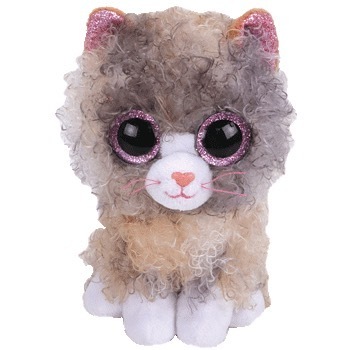 She has large, glittery pink button eyes and a peach coloured button nose with pink thread whiskers. She has a white muzzle and sparkly pink material inside her ears. some would even say it’s swirly! Scrappy was released in 2019. Her Birthday is on 16th October.